About a year ago I asked an incinerator maker to build me a TLUD based on a design I’d seen on YouTube. Yesterday it worked properly for the first time. 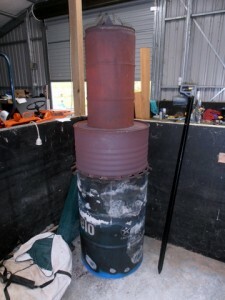 The main burner barrel has 50 x 25mm holes in the bottom and stands on 3 bricks during the burn. The middle section is half a 300 litre barrel afterburner with a series of tabs cut in the lower edge. Tabs are alternately turned inwards and outwards. They both support and stabilise the afterburner and allow secondary air into the chamber. The flue is a 50 litre oil drum punched through; probably a bit too short and wide but it appears to do the job. When I first tried it I used cryptomeria that had been through a mulcher and failed completely. Although cryptomeria is full of volatiles and should burn well, the chip size was too small and simply choked the fire. About a year ago we had a pile of old pine trees cut down and mostly chipped into pieces 10-25mm and now we have several large piles of chip awaiting use. 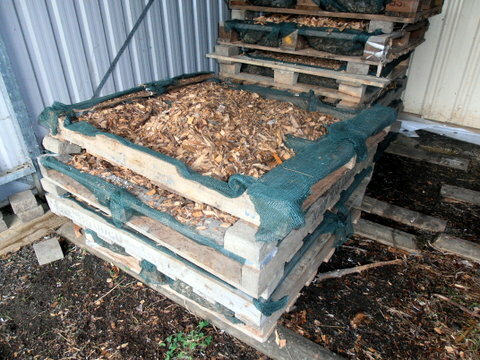 At the end of summer I had as much of the driest material as I could put into trays made of old freight pallets and stacked in the barn until the weather changed and the fire bans disappeared. Yesterday, with the help of my mate Simon Coughlan, I filled the TLUD and set it off again. This time the burn was nearly perfect. It was smokeless from almost the first moment and 2 hours later the first of the embers started to fall through the air holes in the bottom so I doused it with about 50 litres of water. Zero visible emissions from the moment we lit the top. After a long hot summer and another couple of months stacked in a breezy barn but out of the rain, moisture levels must have been pretty low, after comparison with known material at 25% I am going for under 20%. The burn was silent so probably not a very strong draw but the product is very acceptable. Probably a better flue would shorten the burn time rather than improve the quality. The char is mostly odourless and snaps/crushes readily, I’m pleased with it. There was a very slight unevenness in the burn within the barrel, only visible at the very bottom with most of the unburned chip to one side, I’m guessing it was because that side was closest to a slight slope up from the concrete pad we were burning on and the air flow might have been slightly inhibited on that side. There was very little smell of incomplete charring, again, guessing that it came only from the unfinished char at the margins. The char is very hydrophilic, it soaked up the water really well and remains moist to the touch next morning. Total product almost exactly 30% I put in 300 litres and carried away 5 x 20 litre trugs of material, including the incomplete char. Use taller bricks to support the barrel and possibly even out the air flow to reduce further the uneven burn. Its not critical but doing better is good. Add fuel during the burn. As the charge in the barrel sank, I could see the twigs we used to start the fire sitting on the top, charred but complete so I could tell that the system was working and there was no air in the upper part of the barrel which was very hot.At that point I experimented with tossing in via the flue some random twigs lying about. Apart from one that caught on the top of the chimney, none of them produced any smoke so I am convinced that they dropped onto the top of the char bed and did not burn but rather pyrolised and all the off-gasses were then burned in the afterburner.I guess that since the upper part of the barrel is both very hot and oxygen free, we should be able to add an arbitrary amount of new material to the char bed as the process continues. The new material will not be able to cool the fire because that is going on well below the top of the char bed which itself will insulate the flame front and the flame is, in any case, being fed from below. 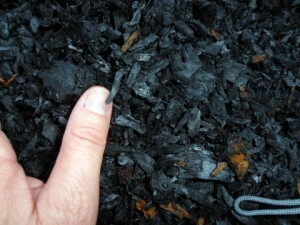 As long as the new material does not significantly interfere with the gas flows (either by collapsing the char with extra weight so that the upper bed becomes impermeable to the gasses or by being too fine and acting as a blanket) we should be able to keep adding new material throughout the burn if we are prepared to accept that some might not be fully pyrolised at the end. Since the burn takes about 2 hours I’m thinking we can add new material from about 30 minutes in as the bed gets well below the top of the barrel and keep adding until about 90 minutes in and still expect to get it fully charred. The good thing is that size should not matter. If there are too many small pieces in the original charge they snuff out the air flow, if the pieces are too large they create uneven pathways that make the burn too assymetrical, but once the flame front is well buried in the charge, the size of the pieces being added should be irrelevant as long as they are not too heavy for the char bed or too thick to fully char in the available time. Another plus is that the extra fuel will have no production cost. All of the chipped fuel/charge has to be run through the chipper which has a cost, but picking up random rubbish fuel from anywhere that can be added later has a production cost close to zero;the rubbish needed picking up anyway and there are no extra processing steps. That should make the resource cost efficiency as high as possible with this system. I’ll be interested to see how high a moisture content we can get away with. I will make a stack of larger pieces and probably add them by removing the flue temporarily. Although a design with a sealable feeder chute would be better, if anyone has a design for one let me know in the comments. I am unhappy with the amount of waste heat the system produces, If I had been able to capture the energy given to heating the air around the barrel I could have baked 20 loaves of bread or roasted a meal for 6, possibly while doing a stir fry on the top of the afterburner.From a sustainability and energy efficiency perspective, there is a crying need for an equivalent of a wood-fired pizza oven that will do some real work with the heat while producing the charcoal. I’m prepared to put some $$ into a real idea for that.